Meeting the needs of users by facilitating the use of HAL is the priority objective of the CCSD’s roadmap. The simplification of the deposit is the main expectation. The 2017 developments were focused on this objective and on September 20, the CCSD team organized a presentation of the new repository interface. Other evolutions have also been presented: the display of the literature cited in the documents and the setting up of a triple store for the semantic web. The presentation has been recorded and you can watch the video (in french). We summarize everything in this post. Automatic authors’ affiliation wherever possible: the information is retrieved from the pdf file, in the author’s idHAL, or calculated by an algorithm. Blog post : new metadata for the document type « Other publications ». You need to display the complete list of metadata and use the field « Type of the publication ». Book review : new metadata for the document type « Other publications ». You need to display the complete list of metadata and use the field « Type of the publication ». Cited literature : by viewing a record, you can view and use the literature cited in the document. It is extracted from the pdf file. All HAL deposits that have been processed display the “See cited literature” tab when viewing the record. Ergonomics has changed: a single page divided into sections (file repository, document description, authors metadata and affiliations) with a free navigation between the sections. Two types of display: a simple view that displays only required metadata and a detailed view with all the options and metadata (see Views). Optimization of automatic retrieval of metadata to complete the repository from the pdf file, identifiers like the DOI, etc. Dictionary notice : new metadata for the document type « Other publications ». You need to display the complete list of metadata and use the field « Type of the publication ». E-mail alert preferences : HAL generates the automatic sending of e-mails when a deposit is put online (to identified co-authors, to structure referents and to administrators). You can choose not to receive them by setting your preferences. Federated identity : connection to HAL with an ORCID account. You must have an idHAL (author identifier) associated to your ORCID account. idHAL : no change for the author identifier idHAL but it is no more in the menu My Space/My idHAL. You find it in My space/My profile. In press : new metadata for articles, books, direction of work or proceedings and book sections. Licence : the metadata “Licence” has been moved and you find it by displaying the complete list of metadata. ORCID : if your ORCID identifier is associated with your idHAL, you can connect to HAL with your ORCID account (see Federated identity). Research structures: in AuréHAL, two additional levels to describe the administrative hierarchy between several research structures are available to portal administrators. With these levels, it is possible to describe structures gathering 1/ laboratories and 2/ institutions (eg COMUE). These levels can only be created in AuréHAL. However, structures of this type are available to affiliate authors in the deposit. Submission preferences : you can choose the deposit interface (see Views. If you choose the option «Add me as an author », you can also add your affiliation. Each deposit will be completed by the affiliation chosen in your preferences. A record can be supplemented with a file (the import is no longer rejected because of duplicate detection). You can import on behalf of another user (header On-Behalf-of). Users depositing via the Dissemin application will thus be the owners of their repository in HAL. Translation : new metadata for the document type « Other publications ». You need to display the complete list of metadata and use the field « Type of the publication ». Transfer to arXiv or Pubmed Central: the conditions to be fulfilled for a transfer to these databases are checked before registration of the deposit. Triple store : the data.archives-ouvertes.fr portal gives access to the database containing structured data in RDF format. 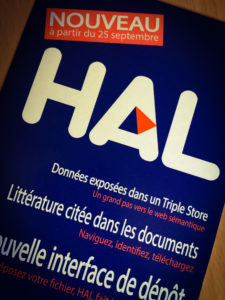 This database, also called Triplestore, contains all the data present in the open archive HAL as well as in AuréHAL. User documentation : new look for user documentation (FAQ, videos, search engine). You find it at http://doc.archives-ouvertes.fr. Simple View: The most visible feature of the new submission interface, the single view displays only required fields and metadata that were retrieved automatically. In your submission preferences available in your profile, you can choose this view as the default submission form. You can switch to the detailed view if needed when you deposit. Detailed view: The detailed view displays a full list of options and metadata for the submission. The same principles of default choice and display as for the single view.